Hopefully yours, Connie: Infertility Sadness: Is it "the blues" or depression? Most of us who have grappled with infertility will readily admit to hours of sadness, days of feeling rotten and even periods of being emotionally overwhelmed. We may believe that those feelings go with the territory of infertility. But what if the time comes when we feel so unlike our "old self" that we begin to question whether the blue cloud hanging over us is here to stay? 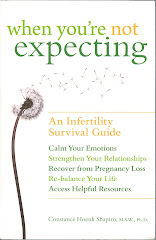 Given the built-in stress of infertility, some sadness is inevitable. Our dreams of parenthood have been up-ended and deferred. We may be on hormones that affect our mood. We now have an unanticipated lurch in our relationship with our partner that makes us both walk on eggshells, first trying to comfort and next suppressing our painful emotions. Many of us find our sad feelings are episodic, perhaps relating to our menstrual cycle, to hormone treatments, to test outcomes or to toxic situations such as baby showers or announcements of a friend's pregnancy. So on the continuum of sadness, situational sadness is the least serious, and profound depression is the most serious. However, the issue of sadness/depression reminds us that our psyches need more attention that they are getting. In that spirit, let me mention a few things to consider as you resolve to make your mental health a high priority during your treatment for infertility. This is especially urgent if you have symptoms of depression, including persistent sadness, guilt or irritability, sleep and appetite disruption, and the absence of pleasure. Depression is not only a mental disorder, so in addressing some of the physical symptoms you will want to be careful about what you eat and drink (avoid caffeine, which can make you anxious; avoid alcohol, which may worsen depressive symptoms). Since sleep disturbance is a common symptom of depression, it is critical to get an ample amount of sleep. So what if you are attentive to all of these things and your sadness/depression does not abate? Now is the time to alert your infertility specialist to the ways in which your mood is disrupting your functioning and your life satisfaction. If you receive infertility treatment in a clinic that employs mental health professionals on its staff, hopefully you can consult with them. In addition, your infertility specialist may be able to change your hormone treatments to have a less disruptive effect on your mood. If your infertility clinic does not have mental health professionals on staff, it still is possible they can suggest names of people whom their patients have used. You will want to have a consultation with a psychiatrist, in an effort to determine what mood disturbances you are experiencing; it also is the time to identify a therapist who is skilled in strategies of cognitive behavioral therapy, which is future oriented, teaching mental skills that address negative thought patterns and challenge feelings of helplessness. Clearly it is a challenge to think of enlarging your treatment network to include professionals who will focus on your mental health. But if you have identified with the issues I present in today's blog, there is no better step you can take than to make your mental health a top priority. In my book When You're Not Expecting, I have several chapters devoted to seeking and achieving emotional resilience, as well as a Resource section at the end of the book with national organizations that can help you in making connections with professionals in your locality. Take a deep breath and resolve to pursue this additional resource today!